A video footage of an Indian man dancing in front of cops is making rounds on social media. Is it really possible for an accused to perform a disco dance before the police? Can a person, charged with committing an offence, shake a leg before a lawmaker? In a viral video, an accused in black magic cases was seen performing to Mithun Da’s music in front of the Charminar MLA Syed Ahmed Pasha Quadri and the cops recently. Dressed from head to toe in white, the baba can be seen dancing to Bollywood tunes and police officials were seen enjoying his performance. Anwar is accused of practising black magic and was reportedly arrested in a Rs 45 lakh fraud case. According to media reports, he claimed that he was a close relative of the MLA and had requested police to set him free. 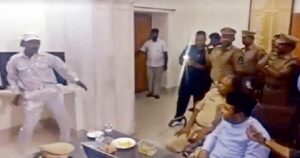 On being alerted, MLA Pasha visited the DCP’s office and questioned the Disco Dancer about his strange outfit. After learning that Anwar is a performer, the MLA asked him to dance to the tunes of the famous ‘I am a Disco Dancer’ song. “Disco Baba”, who claims to be a Unani doctor, handed over gold-polished biscuits and diamonds to Hussain claiming them to be original, for which, Hussain paid Rs. 35 lakhs to him. Earlier, a number of fraud cases had been registered against “Disco Baba” in different police stations in 2004, 2015 and 2016.